Browse: Home / aircrack-ng Version 1.2-rc4 : is a set of tools for auditing wireless networks. * Airodump-ng: Increase console window size. * Aircrack-ng: Added time remaining and percentage done when doing WPA cracking with a dictionary (file). * Aircrack-ng: Make benchmark last 15 seconds for a more accurate value. * Aircrack-ng: Fixed compilation on Cygwin 64 and drastically improve cracking speed for all CPUs (up to +175% performance). * Airmon-ng: Improved chipset detection on FreeBSD. * Airmon-ng: Display chipset for some Broadcom SDIO. * Airbase-ng: Fixed broadcasting ‘default’. * General: Updated and cleanup TravisCI file to test compilation and testing on OSX. * General: Fixed reading large files on Cygwin. * General: Fixed a bunch of compilation warnings with gcc and clang. * General: Fixed compilation on Solaris, OpenBSD, DragonFlyBSD 4.4, NetBSD, OSX. * General: Fixed compilation on ARM and MIPS. * General: Improved compatibility on FreeBSD and Cygwin (RAM and CPU detection). * General: Fixed gcc segfault on cygwin. * General: Memory cleanups, fixed memory leaks and fix other issues reported by Valgrind. * Testing: Fixes on various OSes. * INSTALLING: Updated installation instructions for different OS. 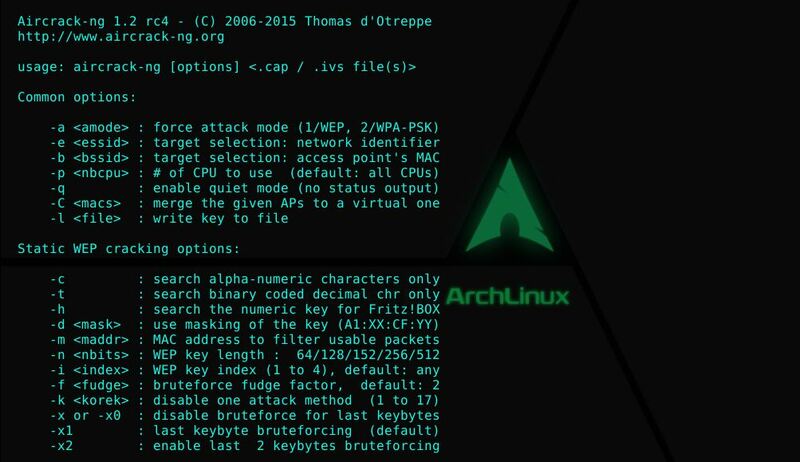 It can attack WPA1/2 networks with some advanced methods or simply by brute force. It can also fully use a multiprocessor system to its full power in order to speed up the cracking process. Tools Available on Windows and all Linux Variant. + OpenSSL development package or libgcrypt development package. + Airmon-ng (Linux) requires ethtool. + On windows, cygwin has to be used and it also requires w32api package. + Linux: LibNetlink 1 or 3. It can be disabled by setting the flag ‘libnl’ to false. ← SSLyze v0.13.4 – Fast and full-featured SSL scanner.